Zephyrtronics Equipment is Engineered and Manufactured in the United States of America. Neatly Organizes & Holds 6-12 of Your Solder Paste Syringes Vertically! What Great Convenience! Yet Another World-First Innovation from Zephyrtronics! Another World-First for Storing 10cc Solder Paste Syringes to Refrigerate! The bright engineers at Zephyrtronics designed this novel and utilitarian product to the global electronic benchtop theater. 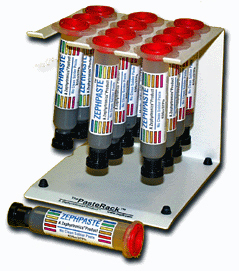 The PasteRack™ now makes storing your solder paste in your industrial refrigerator a breeze. Available in two models -- for 6, 9 and for 12 barrels/syringes! A benchtop essential. Industry Standard of Vertical Positioning: Always store your solder paste vertically to prevent air bubbles in paste and backward seepage. Importance of Vertical Positioning: For decades, the industry-standard for storing solder paste barrels or syringes has been to position them vertically to prevent any undesired, backward-seeping of the paste back beyond the piston. The PasteRack™ is your helpful solution to this age-old problem. Space Saving & Economical Design: Understanding the reality that most industrial refrigerators are small in size and capacity, The PasteRack™ is very compact. Made in the U.S.A. at the Zephyrtronics factory. Convenient Dispensing Slots: How much more accessible could it be to quickly select and retrieve your solder paste than this? The PasteRack™ conveniently suspends your solder paste where it is readily at your fingertips when you need it! Rubber, Skid Resistant Feet: Still another feature of The PasteRack™ is the integrated rubber, skid resistant feet which not only prevent unwanted movement of the unit, but further help prevent scratching of glass shelves which may be in your industrial refrigerator. Industry-Recommended Vertical Storage: How many times have you searched the bins within your industrial refrigerator for solder paste and discovered the paste had seeped backwards due to an improper angle during refrigeration? Your paste may be fresh alright, but now it's too messy to use! The PasteRack™ resolves that nuisance forever. No more messy syringes. Your paste hangs vertically. Available in Two Models: The PasteRack™ is available in two models, one which holds up to 6 (six) 10cc syringes/barrels (the ZT-8-0006) and a slightly larger, but still compact model which holds up to 12 (twelve) syringes/barrels (the ZT-8-0012). Ideal for use with Zephpaste™. ©1996 - 2011, 2012, 2013, 2014, 2015, 2016, 2017, 2108, 2019 by Zephyrtronics®. All rights reserved. The information, text, images, photographs, charts, graphs you receive online from Zephyrtronics® are protected by the copyright laws of the United States. The copyright laws prohibit any copying, redistributing, retransmitting, or repurposing of any copyright-protected material. Zephyrtronics is the registered trademark property of JTI, Inc. "The Science of Zephyrtronics" and "Simplicity Through Innovation" and "Zephlux" and "ZeroLead" and "Zero Balling" and "Zero Residue" and "Post Cooling" and "Post Cooler" and "AirBath" and "SolderGlide" and "SolderMill" "ZeroTouch" and "Just So Superior" are the protected trademark property of JTI, Inc. "Zephyrtronics" and "Low Melt" and "Air Fountain" and "Fountainhead" are the registered trademark properties of JTI Inc. *The above names are the registered property of their respective owners.